Remember Flat Stanley? Well...he can move over for FLAT SEYMOUR! In 1981, "Seymour of Anchorage" was adopted as the Anchorage’s ambassador of goodwill, inviting people throughout the world to get wild about Anchorage! This is clearly something peculiar to Anchorage. 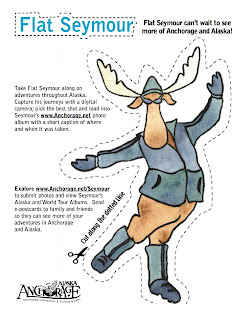 The idea being is that you take Flat Seymour and photograph him in some wild places around Alaska and other exotic destinations throughout the world to post in Flat Seymour's online photo album. Even though it appears to be something only for locals, I'm sure we all could have some fun with him!